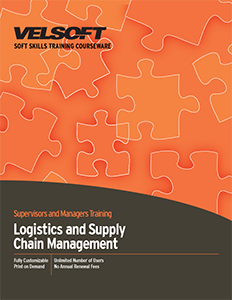 Logistics and Supply Chain Management Training Materials are designed for trainers to develop supervisors’ and managers’ ability to provide Logistics and Supply Chain Management to their employees. Teach management when Logistics and Supply Chain Management is needed, how to develop communication strategies, the six characteristics of Logistics and Supply Chain Management and more! Seeing is Believing This sample manual to teach Logistics and Supply Chain Management is in MS Word format. More businesses than ever are focusing on how they manage their supply chain. If you're not offering training on this important topic yet, you can purchase this package of training materials today and start training tomorrow. We've designed a comprehensive, customizable course that will help you teach participants how to optimize the flow of products and services as they are planned, sourced, made, and delivered, and give their business a competitive edge. This two-day course covers supply chain management basics (such as core processes and drivers), management skills like risk evaluation and benchmarking, as well as cutting-edge trends like Lean process improvement and outsourcing activities to third-party logistics providers. This supply chain management training package includes a detailed instructor's guide with plenty of hands-on activities, discussion points, and icebreakers. Supporting materials include a student manual, handouts, assessments, PowerPoint slides, and much more. Check out a sample today!